In 2009, Grant Page discovered a process to purify salt water that could change the world. Working in the garage at his house on Shore Drive in Virginia Beach, Page had set out to find an environmentally safe way to put chrome plating on car parts. During one experiment, he discovered two alloys that, when salt water passed over them, extracted the salt from the water and created energy. The potential industrial and humanitarian uses for Page’s discovery intrigued him, and as a midshipman at the United States Naval Academy in Annapolis, Md., he continued to develop the technology he had created. Instead of a garage, he logged hours at the Naval Research Laboratory and emerged with three prototypes. The end result was the Electrochemical Nano Diffusion (END®) process. The END® process uses electrochemical reactions to purify water by removing salt, heavy metals and even certain bacteria and viruses. There are no moving parts, the units consume small amounts of energy, and no pressure is required. 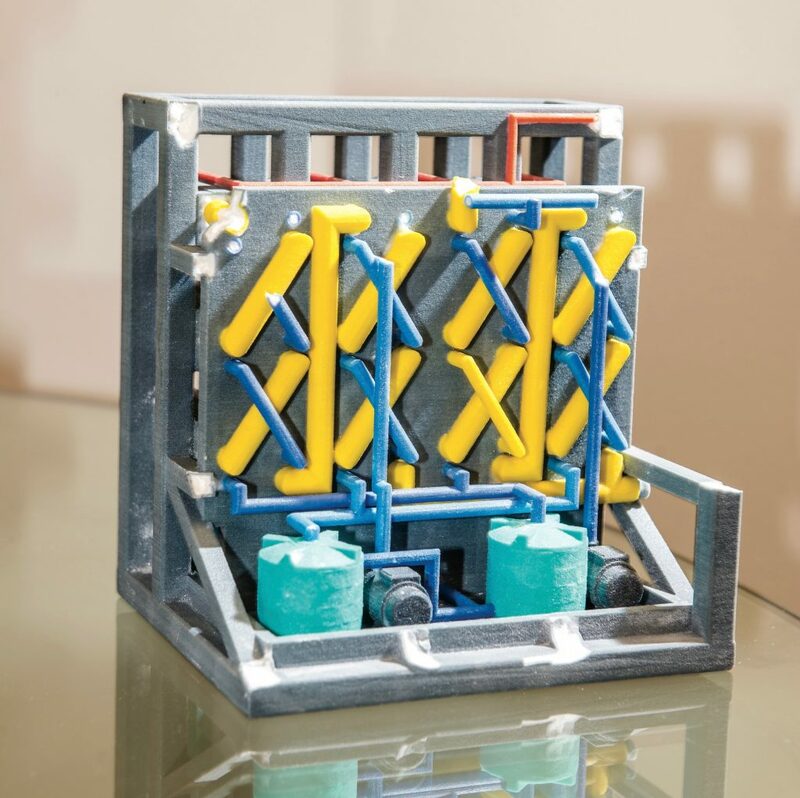 The stackable cells can be scaled to fit any size operation and generate virtually no noise, making the process an ideal solution for industrial and military applications. The resulting waste is closer to a solid than a liquid, and even the process’ byproduct can be useful. Chemical companies can harvest salt from the waste to use as rock salt to melt ice and snow on roads in the winter. In 2014, Page received approval from the Navy to start a business while on active duty. After three rounds of fundraising that netted nearly $8 million, Page launched Magna Imperio Systems. Headquartered in Virginia Beach, the company has additional locations in California and Delaware, as well as a 50,000-square-foot facility in Houston, Texas. Earlier this year, Page submitted resignation papers to the Navy so he could focus on his business full time. In the coming years, he hopes to hire several new employees in Coastal Virginia, including engineers and business developers. Currently MI Systems is working with the Hampton Roads Sanitation District (HRSD) to get approval to test wastewater. 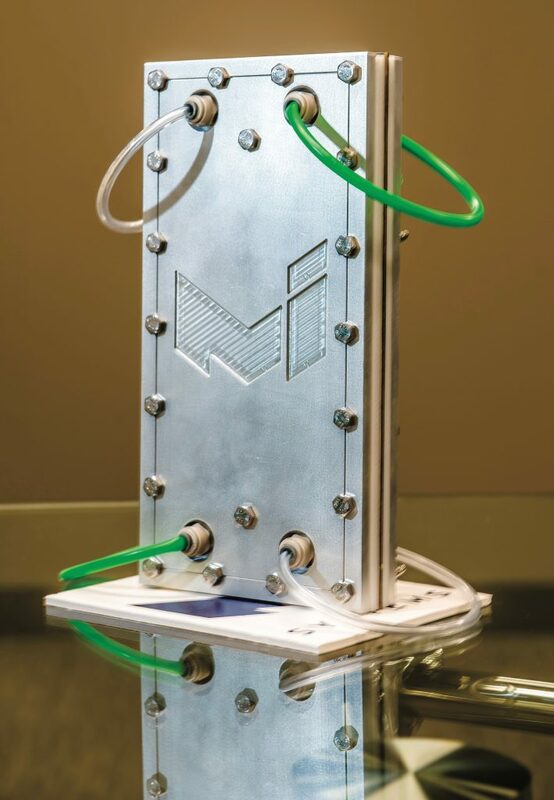 If approved, MI Systems would install and monitor units that would help clean 120 million gallons of water a day. 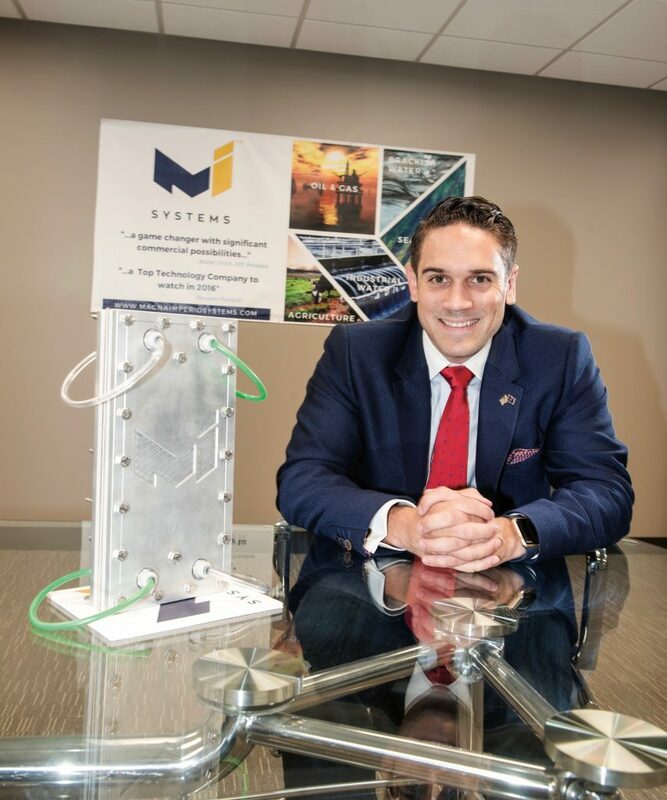 MI Systems is also working with Southwestern Energy, a natural gas and petroleum exploration and production company, and Huntsman Corporation, which manufactures chemical products. While there are numerous industries that can benefit from the END® process, the technology has the potential to provide humanitarian aid on a global scale. Providing technology that would allow millions of people access to clean drinking water is one of Page’s business goals. He has spoken with leaders of foreign countries, including India, Saudi Arabia, United Arab Emirates and Mexico, as well as aid groups in those countries. “Solving the world’s water issues is this generation’s problem,” he says. For more information, visit MagnaImperioSystems.com.